This is a close up photo of the winter scene so you can see the detail in the honeydew fruit carvings of the sled, reindeer and snowman. This is a edible fruit carving arrangement for a Christmas party so I made a winter scene complete with a snowman, sled and reindeer. 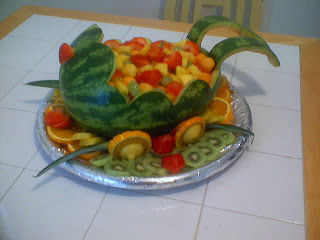 Thanks for checking out my new fruit carving and vegetable carving blog! 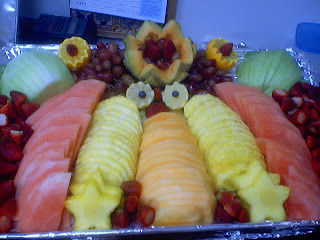 I will be showing you how to make a fruit basket, a fruit bowl and other edible fruit and vegetable arrangements. I will also show you "Kae-Sa-Luk", the unique Thai art of carving fruit and vegetables into intricate flower shapes that was begun in Thailand for the Royal Family in 1346. 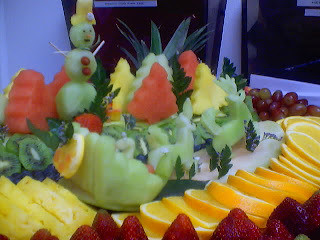 I will also explore the French art of carving fruit, vegetables and ice – called "Garde Mangers". 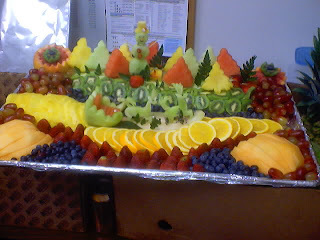 I am posting some photos of old fruit carvings and edible arrangements that I have done in the past.